A radical autogyro jump-copter "Personal Air Vehicle" able to make vertical takeoff and landings but cruise in winged flight like an aeroplane has achieved a key flight-test milestone. 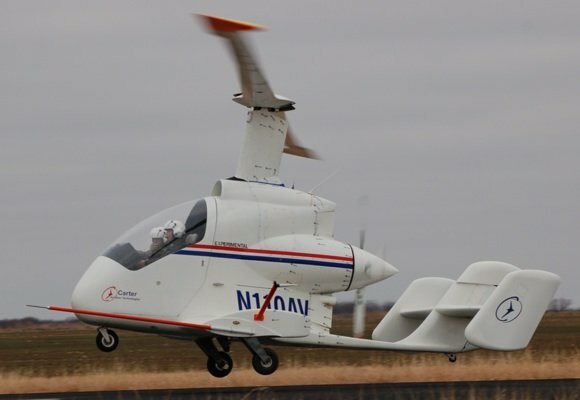 The Personal Air Vehicle (or PAV) is a new design from Carter Aviation of Texas, which has been at work on its "slowed rotor/compound" (SR/C™) technology since 1994. "This is an exciting time for us," enthused company prez Jay Carter Jr in a statement announcing the first flight. "Our first aircraft proved the viability of our technology. This aircraft translates that technology into a viable consumer product." According to the statement, released last week, the new SR/C PAV design completed a 36-minute flight on 5 January. A 30+ minute flight is an important achievement for Carter, as it is one of eight "milestones" specified in an economic-development-incentive deal the firm has with the city government of Wichita Falls, Texas (where the company is based). An SR/C aircraft has wings and a propellor like a normal light aircraft, but it also has free-spinning rotors like an autogyro. A regular autogyro can take off following a very short roll, but it can't lift off vertically: however the Carter PAV is expected to be able to. It does this by using a small engine-driven "pre-rotator" assembly to gradually spin up its rotors to high speed while sitting stationary on the ground. The pre-rotator doesn't have to transmit much power so it has insignificant size and weight compared to a helicopter's transmission: and the engine isn't required to furnish the massive grunt necessary to support the aircraft in a hover, either. The weighted rotor tips nonetheless mean that after a while there is a large amount of energy stored in the whirling rotor disc, rather as in the case of a spinning flywheel. To lift off, the pre-rotator is declutched and the rotors' pitch increased so that they bite air instead of spinning without resistance. The aircraft lifts off. Left to itself, the craft would soon come down again as the rotor blades slowed, but meanwhile the propellor is pushing it forward to flying speed and the blades begin to turn on their own due to the forward motion: the craft is now flying like an autogyro. As speed increases still more, the rotors are slowed down to reduce drag (this is the Cartercraft's other main special sauce apart from the pre-rotator) and the wings take the strain. At full speed, the jumpcopter is flying as a normal wing-and-prop light aircraft.